It is no secret that the newspaper industry in the United States continues to weather the storm of revenue declines. Last June, the Pew Research Center reported that weekday circulation for daily print newspapers in America in 2016 declined on average by an annual rate of 10 percent from 2015. It’s also no secret that online advertising is absorbing these revenues, while generating new revenue along the way: At about the same time as the Pew report, the Internet Advertising Bureau reported digital advertising revenues for U.S.-based media in the first calendar quarter of 2017 alone climbed 23 percent year-over-year, to $19.6 billion collectively. 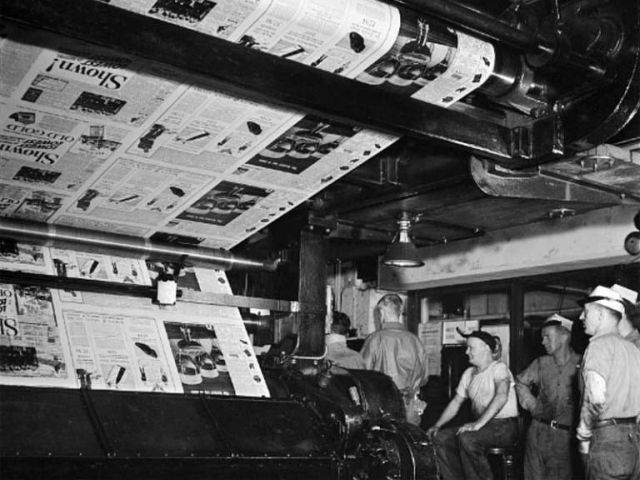 Newspapers, such as they continue to be called, are also in the digital media business. But up until recently, from a standpoint of business units, digital business units have typically been separate from print units. For the sake of their own survival, newspaper publishers need to re-establish themselves as news publishers across all media. This means those separate business units must consolidate — and that means their technology platforms have to come together, immediately. If “integration” means welding together these units’ old software into aggregates, that’s not an option. But it may mean joining their disparate data warehouses, or at the very least, giving employees and journalists the appearance of having done so. On the other coastline, the NYT Company has actually seen revenue growth on its digital side, last month reporting an 11 percent gain year-over-year in digital advertising revenue, attributed to an eye-opening 69 percent annual growth rate for digital subscribers. It’s not enough yet to shut off the watershed of revenue from print, which dropped 20 percent in the same period for a 9 percent annual drop in the quarter for the company overall. For one reason or the other, both companies have a clear mandate to reorient their platform focus around a single, digital base. But their technology strategies for doing so are quite different from one another. “We rebuilt the big data platform from scratch,” said Tronc’s Cantarero. Arguably any newspaper’s most valuable data store is managed by its content management system (CMS). Last March, Tronc had already begun its mission to migrate its CMS to Arc, a platform built at the Washington Post. So whatever data platform the Tronc engineering team would build needed to be effectively decoupled from the CMS, relying on its data feed but not bound permanently to it. The Tronc team’s strategy involved establishing a data-driven platform immediately, with the intent to add machine learning capabilities to the system in stages later. Without much time to evaluate options, it adopted Mesosphere Data Center Operating System (DC/OS) 1.0 on the very week it was released. With DC/OS in place, it would execute an extraordinary kind of reverse migration, engineered as a way to stay safe while it effectively tested its new code in production: It quickly migrated the old Tribune Company’s entire data platform to conventional AWS EC2-based virtual machines. Then the team created Mesos frameworks to assume responsibility for certain data-driven tasks in stages. “We were able to replicate something that took four engineers a year-and-a-half to build, in a matter of weeks at Tronc,” said Cantarero. Kubernetes, he noted, might have been considered as an option if it had evolved back then to the point it’s at today. At his previous position with another firm, he told us, he and his colleagues found themselves building shims for Kubernetes, to enable functionality that was on its roadmap but had not yet been released. Mesos, and by extension DC/OS, had evolved into a complete platform earlier. But even with a fully evolved Kubernetes as an option, said Tronc senior data engineer Matt Chapman, he and his colleagues would probably have rejected it on account of the fact that they would have had to run Spark and Cassandra — vital ingredients for Tronc’s analytics and forthcoming ML operations — in containers rather than natively. Chapman told us that containerized Spark, in his view, suffered from performance issues. And he noted rather pointedly that running most any service under the control of Docker, was not an option. With new services being implemented in stages, Tronc can fall back to its old platform — which is still available through EC2 — if it encounters problems. So the old monolith now serves as a safety net. Chapman and Cantarero admitted that, on occasion, they have had to pull services out of DC/OS and fall back to the EC2 platform, especially when DC/OS is upgraded and the new configuration doesn’t mesh well with Tronc’s added code. The New York Times Company’s digital strategy was inspired by the serverless concept as it was explained to CTO Nick Rockwell: running code without an operating system. It’s a looser definition than how it’s often presented in The New Stack, as a Functions-as-a-Service platform. The New Stack profiled Rockwell and his digital team last April, just after they had made a decision to move NYT’s data stores off of their data warehouse, bypassing Hadoop, into the public cloud with Google BigQuery. Since that time, Rockwell embraced the looser definition of serverlessness, decomposing existing applications and rebuilding their counterparts on Google App Engine. The NYT digital team and its management did investigate the possibility of running its operations in a containerized environment. They did decide to utilize Google Kubernetes Engine for some functions. But like Tronc, NYT decided against managing its own containerized platform, which would have involved placing Kubernetes at the center of its management strategy. One reason, according to Rockwell: Managing Kafka — which is critical to NYT’s current stack — entirely in-house has been too time-consuming, with too little value generated in the process. The contribution of open source to the modernization of infrastructure, Rockwell believes, has been valuable. But that’s coming to an end, he told us, as Amazon, Microsoft, and Google step into the space and start making decisions that development teams would probably be making anyway, only consuming more time in the process. Although the NYT Company and Tronc adopted two different approaches to rapidly transitioning their respective data platforms, both firms’ IT teams saw Kubernetes and containerization as a fork in the road. And rather than taking it, they detoured in order to avoid taking on a larger management workload. There may yet be a lesson here for container platform developers looking to win over larger businesses with smaller IT teams: Fully managed options may end up winning them over, and moving them onto platforms that, under the hood, do use containers. But the customers won’t know that, and may not care. Feature image: Photograph of The New York Times press room circa 1942 originally published by the U.S. War Department, now in the public domain. Google and Mesosphere is a sponsor of The New Stack.